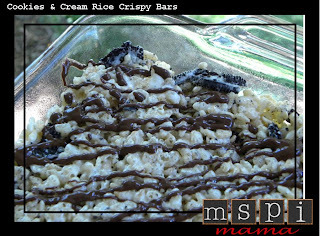 Rice crispy bars are the perfect summertime treat. No oven. No stove. It's all done in the microwave in only a few minutes, and cleanup is a breeze. You can vary the bars so easily with different types of cereal, marshmallows and add-ins -- such as Oreos! I adapted this recipe from Picky Palate for a get-together with some friends. Kids and adults gobbled them up! Place margarine and marshmallows into a large microwavable bowl. Microwave for a few minutes, stirring every 30 seconds, until marshmallows melt and combine with margarine. Remove bowl and stir in cereal and Oreos. Pour into a 9×13-inch baking dish that's been coated with cooking spray. Coat your hands with cooking spray and press and smooth treats into dish. Place chocolate chips in small dish with 1 teaspoon shortening. Microwave for a few minutes, stirring every 30 seconds, until chocolate melts. Add in more shortening, if needed, until chocolate reaches a drizzling consistency. Drizzle melted chocolate over top of treats and let cool. Cut into squares. Just made these for dessert tonight. Looks so yummy! !